Create a budget. Budgeting gives a clear picture of what you can afford so you can balance your income and expenses. The Budgeting and Savings Tools worksheet in the FDIC’s Money Smart financial education program can help you get organized. Try to get a clear picture of your monthly income and expenses. “Even if you have a regular weekly, bi-weekly or monthly paycheck, budgeting enough money to pay your regular expenses and pay down debt may not be easy,” said Elizabeth Ortiz, the FDIC’s deputy director for consumer and community affairs. Know your rights if a debt collector contacts you. Debt collectors have rules they must follow under the Fair Debt Collection Practices Act, such as providing you with a debt validation notice stating the amount you owe and the creditor’s name. Debt collectors are also limited on when and how often they can contact you. For more information on dealing with debt collectors, see Having a Problem with a Debt Collector? You Also Have Protections. 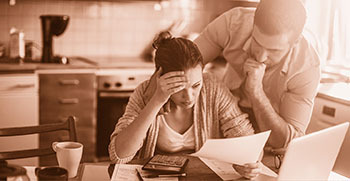 To learn more about solving a debt problem, see the FTC’s Dealing with Debt page and suggestions from the Consumer Financial Protection Bureau.